My house-sitting gig I have been writing about for the past few days was right in the path of Hurricane Irene. This put a little bit of a damper (pun intended) on my plans for my time here. It also put a little more responsibility on me for the other part of my gig – caring for friends’ three dogs and three cats. I was particularly worried about the littlest three adorable Yorkies, Chloe. Chloe is so small and so adorable, I worry that I am going to step on her or something. Or worse, I worry that a hawk is going to swoop down and take her away while I am playing with her in the yard. The extra responsibility came with Chloe’s fear of thunder and loud noises that come along with storms like Irene. I was told about her shaking and hiding and it broke my heart to think that she would suffer during the long duration of the storm. 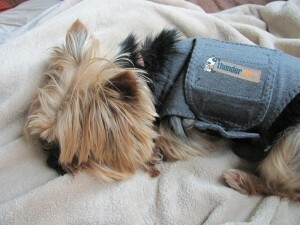 But I need not have worried… I had Thundershirt. This is going to sound like shameless plug for a commercial product, but it is a sincere endorsement. 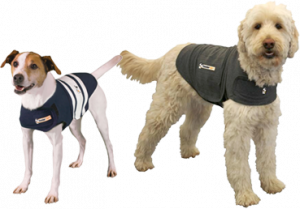 Thundershirt is basically a compression shirt that makes a dog feel secure when under stress – just like the kind Chloe suffers from. It turned out that my friend had ordered one of the shirts for Chloe and reported that it had worked. The other night I was hanging out on the front porch in the humid calm before the storm when the first bands of rain came through. It was really nice to be out there – so warm, no wind and the falling rain. However, off in the distance I heard a single clap of thunder and quickly ran into the house to find Chloe awake from her most recent nap and she was already shaking. I quickly found the Thudershirt and put it on her. She looked so cute in it – but more importantly, she calmed down and settled right back into her calm. I kept it on for the duration of the storm and she was a dream. Meanwhile, thankfully Irene as a whole was just remnants of a tropical storm by the time she reached us just south of Boston. However, there was a lot of rain and wind and left some minor clean up for me in the yard. But the silver lining was higher water levels on the pond – perfect for some late summer canoeing. Lost Cowboy is powered by	WordPress 5.0.4 and delivered to you in 1.860 seconds using 43 queries.